This active regenerating complex, for mature and/or sun damaged skin, helps boost collagen and elastin production to renew skin from the inside out. This treatment restores skin at the cellular level with pentapeptides, helps reduce wrinkles and leaves skin thicker, firmer and more youthful. Stimulates cellular activity and increases collagen and elastin levels. Helps protect the skin from environmental aggressors. Recommended for all skin types, except those with acne or acne-prone skin. Use daily: After cleansing, apply a thin layer to eye area, face, neck and décolleté. Not suitable for acneic or acne-prone skin. I read some of the reviews that stated this product had a not-so-great smell. As this is a subjective claim, i took a chance and purchased, as I've been very happy with other Arcona products, and honestly, I rarely come across a product that had a truly offensive odor. Sure enough, I found the pungent mossy, green smell too much to handle with this item, and unfortunately the smell lingered even after an hour. I attempted to return the item through SkinStore, and they refused refund since it was opened. Take this as a warning when purchasing through SkinStore (and note that DermStore and Nordstroms have much kinder policies, guaranteeing your satisfaction!). This is a great product. It works wonderfully on my skin. I have been using it for the past six months. My skin is firmer and looks much better. The smell is a little earthy but not bad, its a much better smell than the sweet over powering smell of the white ice. The magic white ice is great, but I wanted something more for the winter and decided to try the magic green ice out. 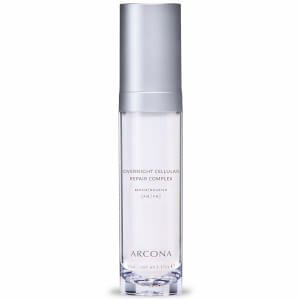 I have sensitive skin that tends to get dry and was prone to break outs before I started arcona. I was surprised to find that it says on the bottle "not suited for acne prone skin"!! I'm alittle nervous but I decided to give it a try anyway. I read all of the ingredients and I'm not sure why it says that. It does not feel greasy at all, and seems so light. Hmmm. We shall see! I'll update on how it goes. I hope I don't regret using this. I was really hoping to love this product based on previous reviews, but I felt that this was very average, particularly for the price. The product was not sticky, relatively lightweight and absorbed easily, but there was no real effect to my skin - good or bad. If the user is looking for a pretty smelling product, this is not it - the smell is not offensive but it is not pretty like some facial products. I didn't mind the smell but some users may be slightly put off. All in all, just a very average serum that seems a little overpriced to me. i cant get pass the smell. the texture seems nice. it smells like those green powder from the health food store. not sure how good it is. This is a great choice for those of us with combination skin who need a richer moisturizer in the fall/winter. It's not heavy yet does a good job of moisturizing. It is an odd green color with a gel consistency but even on my very fair skin the green doesn't show up on my face after use, so don't be put off by the color. It smells "green" too, probably from the high amount of chloropyll in the ingredients, but I like the scent myself. Great over their Youth Serum or Booster Defense Serum and under their Desert Mist for truly well-protected, smooth, bright skin! I LOVE this stuff. Everything I've tried Arcona and its all been great, but this one is my favorite for sure and I wouldn't be without it. I have roscesea and this works better the Rx my doc gave me, plus faster and it's NATURAL. It is amazing and if you use it daily under your moisturizer, you will see your skin transform in a few days. Plus, it's not as expensive as a lot of other brands I've tried them all. I am over 50 and I am sold on this brand. This lotion equals a facial. At the second you put it on, it looks like your skin just received a bowl of oxygen. The smell is algae like, but it doesn't last. The result are worth every penny, even the smell. The most fantastic lotion ever. It's a must have.